We will sometimes say before allowing the father to enter the room "are you ready to see your daughter for the last time as a single woman?" and though it is meant to bring out emotion, it is true emotion and feelings towards the one he has raised from small baby to the woman she is today. 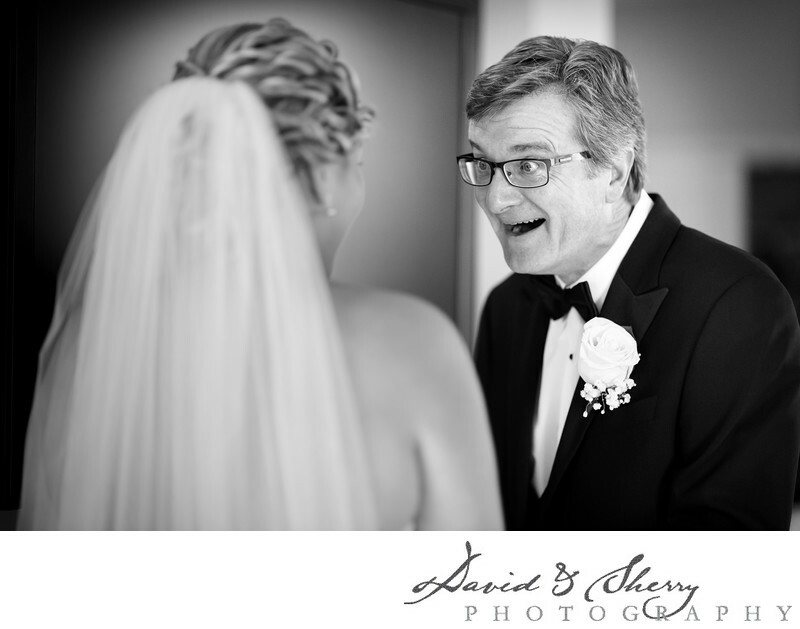 We have seen all kinds of different emotions from dad when he sees her in her wedding gown with hair and makeup all done ready to see her groom, but this is one of the best reactions that we have seen in all of our years of photographing weddings. The shock, awe and excitement of dad in his facial expression tells all the words you need to know from this photo. We love capturing all of these little moments when we take pictures at weddings and know that each time a client hires us they are entrusting us with the memories they will cherish for generations to come. Wedding photos are perhaps the pictures we look back on the most in our lives as we bring them out on special anniversaries, occasions and get togethers with family and friends to relive the day. Let us be there to capture each moment for you.